In addition to learning about the Pantone system and font rendering, students in Augsburg's fall semester graphic design classes gained knowledge about three things: the Augsburg Health Commons, socks, and what it's like to work in a professional design situation. "We learned how to work together and to take criticism," said Vince Undis '14, a mass communications major. "And that deadlines are no joke," added Patrick Werle '13, a creative writing major. Students in Graphic Design I and II spent the fall semester researching the history, philosophy, and practice of the Augsburg Central Health Commons and the Health Commons at Dar Ul-Quba. They also learned that to many of the 20,000 people seen by the nurses every year at the Commons, a pair of clean socks can be very important. The result of the students' work is "Health Commons: Exhibition and Sock Exchange," on view through January 9, 2013 in the Christensen Center student art gallery. At the beginning of the semester, assistant art professor Christopher Houtlberg presented the Health Commons as a topic for the classes' project. Students in Graphic Design II created the initial design and color palette and presented it to their "client," Katie Clark, coordinator of the Central Health Commons in downtown Minneapolis. After reviewing the design concepts with Clark and making revisions based on her feedback, the students in Graphic Design I and II worked in groups on different aspects of the exhibit. They visited the Health Commons, met with clients and staff, and conducted research. At each stage of the project, students received input from Houltberg and Clark and learned how the professional design process works. The exhibit includes a timeline of the Health Commons, panels that highlight the program's philosophy, quotes from Clark and from clients of the Commons, and, of course, socks—sock collection containers, images of socks, and information about diseases and health issues that can be caused by wearing dirty socks. Visitors to the exhibit can donate new, clean socks in exchange for an original print created by one of the students. One of the challenges faced by communication studies major Jane Veitenheimer '14 and her group was how to make the design of the sock collection element interactive. "We wanted it to be an exchange, we wanted all the prints to be displayed, and we wanted all of the donations to be visible," Veitenheimer said. She and her group decided to hang the 360 prints from twine "clothesline" suspended from the ceiling and mounted collection boxes—repurposed materials from the art studio—on the gallery wall. "This was real work, as opposed to just doing an assignment," said Lauren Johnson '13, one of few studio art majors in the classes. "You're doing something real and something that matters." 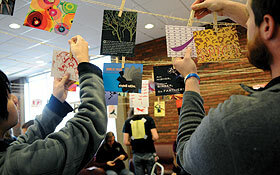 Students hope the exhibit raises awareness about the Health Commons. "Augsburg is a unique school in that we see homeless people every day on campus and it's easy to overlook them," Undis said. "We hope this exhibit shows people that there's a right way to help homeless people...that giving them a pair of clean socks might be better than giving them a dollar or just ignoring them." Jenny Wheatley, the Augsburg art gallery coordinator, worked with Houtlberg's students on the exhibit installation. "This exhibit is about connections," she said. "The students connected with the Health Commons and the people there, and they connected with each other. Now they are connecting with the community through the exhibit, and their hope is that the community connects with the Health Commons. It's a wonderful circle." Photo: Bee Vang '15 and Vince Undis '14 hang the prints, which were created by the Graphic Design I and II students, in the exhibit. Photo by Stephen Geffre. Nursing students at Augsburg College provide services at two nursing-led free centers dedicated to serving those in need. The people who come to the Health Commons are from diverse cultural and socioeconomic backgrounds, and all services are provided free of charge. Health concerns might include nutrition, medication, stress management, respiratory conditions, injuries, skin problems, and chronic disease such as diabetes and hypertension. The Central Health Commons also provides clean socks and basic personal care items. Learn more on the Augsburg College Nursing website about volunteering at the Augsburg Central Health Commons at Central Lutheran Church in downtown Minneapolis or the Health Commons at Dar Ul-Quba in Cedar-Riverside.